Electronic high capacity platform scale developed to weigh bariatric, as well as, normal weight range patients. 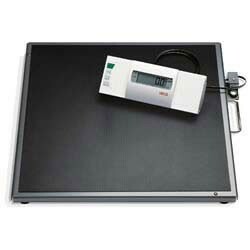 Platform size of 24" x 24" assures accurate, comfortable weight of largest patients. Wired remote display can be wall mounted as well as hand-held or placed on a desk. HOLD function, .2 pound graduations, LB/kg switchable. A/C power supply, UL adapter. BMI function. Weight capacity: 800 lbs. 2-year warranty. Special order, drop-ship only.